Stacy Martinez, 25, had just given birth to twin girls via Cesarean when she suddenly became unresponsive. Staff quickly learned that Stacy had developed an amniotic embolism. It had stopped her heart and, at best, she had only a 40 percent chance of survival. Stacy Martinez (center) is shown with (from left) medical staff members Jason Ramaker, Kim Federico, Jessica Jenkins and Kelley Thompson, during a recent reunion at Franciscan St. Anthony Health-Crown Point. Not pictured is Sheila Steward.? 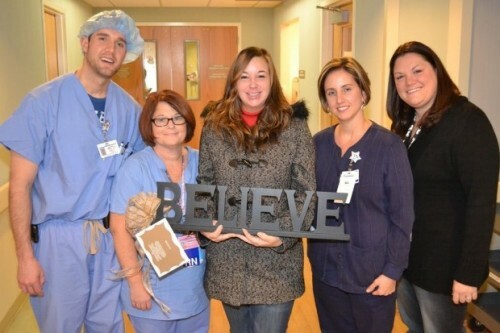 After intubating Stacy and restarting her heart six times, Stacy was taken to surgery. She was then transferred to the University of Chicago hospital. The whole time, staff prayed for her and gave her words of encouragement. While waiting to hear back on Stacy’s status, the staff said that they struggled with sleeping, eating and concentrating. But Stacy pulled through, miraculously, and was discharged just four days after her transfer to the University of Chicago hospital. Now Stacy is back home with her husband and children – the twins, Mila and Scarlett as well as two older children, Jacob, 3, and Lilliana, 18 months. And after the ordeal, her husband, Jason, has been permitted to transfer his home base from Texas to the Chicago area. Stacy says that, even though she doesn’t remember the ordeal, she’s amazed at the sheer number of people who’d prayed for her and helped her pull through. And Stacy made sure she told the staff in person during the reunion.